Brighten up the corners of your living space whilst sharing your most cherished memories with this beautifully simple 10"x8"photo frame. It features a freestanding plush velvet back and an elegant beaded trim for the ultimate luxury feel. It's versatile sterling silver design means you can share those special moments all around your home. 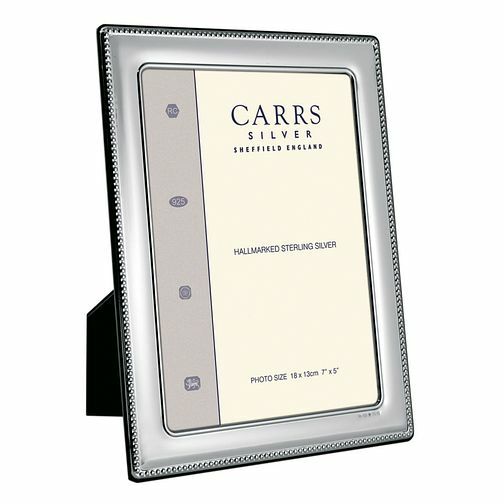 Carrs Sterling Silver 10"x8" Beaded Trim Photo Frame is rated 5.0 out of 5 by 1. Rated 5 out of 5 by Anonymous from I loved this photo frame The design is lovely and the quality is excellent for the price. I bought this as a wedding present for my nephew and I am sure that he and his wife will love it.